As presidents and other world dignitaries gathered in Northwest D.C. to bid farewell to our 41st president, an Arlington chain restaurant's 40th-anniversary promotion was proceeding in decidedly less-dignified fashion. WASHINGTON — While presidents and other world dignitaries bid farewell to our 41st president Wednesday in D.C., an Arlington chain restaurant’s 40th-anniversary celebration was proceeding in decidedly less-dignified fashion across the river. 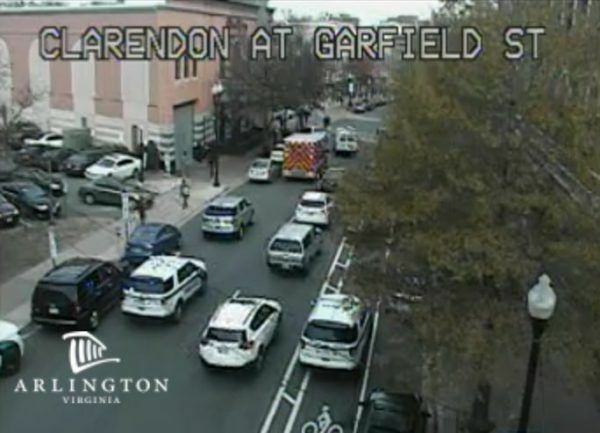 As first reported by Arlington Now, police were called to the local Cheesecake Factory location — in the 2900 block of Clarendon Boulevard in Arlington — to respond to traffic complaints and even a fight in progress. When officers showed up, there was no fight to be seen but a very large crowd, Arlington police spokesperson Ashley Savage told WTOP. The apparent cause of the commotion? In addition to that siren song of free dessert, Door Dash’s involvement was causing many drivers to double-park outside the location. An unhappy crowd had formed inside — because free cheesecake rules, missing out on it stinks, “I need to get out of this parking spot” and yada yada yada. Officers attempted to calm the situation, Savage said, but someone was not ready to let go of his grievances. That person, whom police declined to identify, remained disorderly. Police tried to arrest the person, Savage said. A struggle ensued, and the person was taken into custody and later evaluated at a hospital. That person, she said, will likely be charged with disorderly conduct. A perusal of Twitter indicates that the incident in Arlington might not have been isolated. According to one report, many locations had run out of cheesecake by 2 p.m.
WTOP has reached out to a Cheesecake Factory spokesperson for comment.